Infrared 590nm, converted to faux colour. 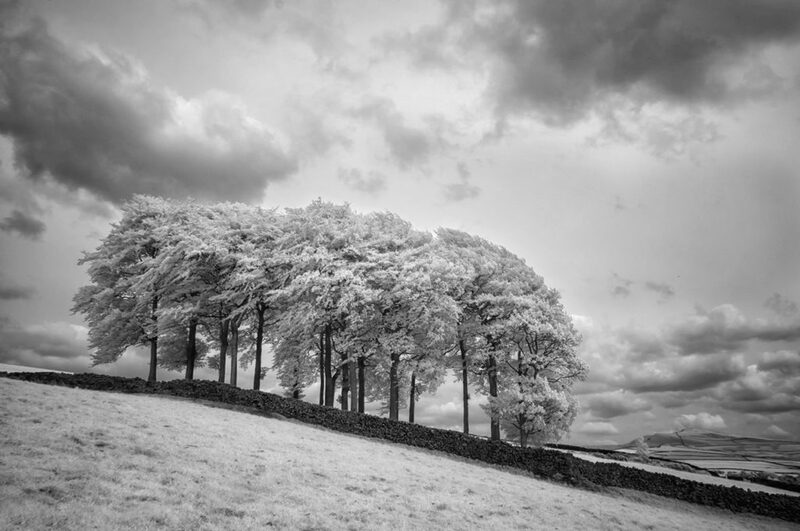 This elegant copse of trees stands high on a hillside overlooking the village of Hayfield, along a footpath called The Snake Path. 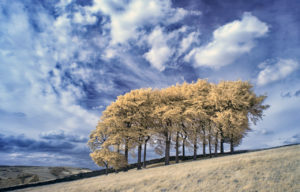 While the copse retains its name, “Twenty Trees”, there are, in fact, only nineteen. There were twenty until 1944, when a local farmer sent two young lads out to saw down one of the trees so he could make gateposts. After felling the tree, the lads used two horses to pull out the stump, so there is no evidence of the missing tree today. 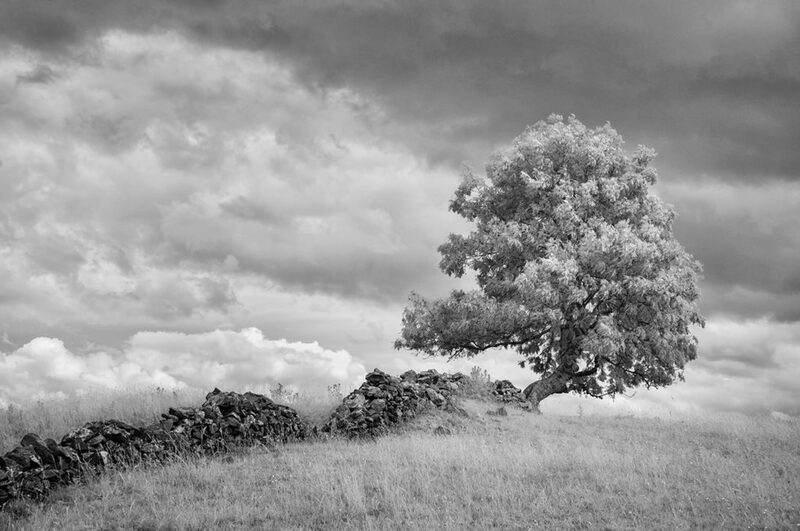 Infrared 590nm, converted to B&W with Nik Silver Efex Pro 2. 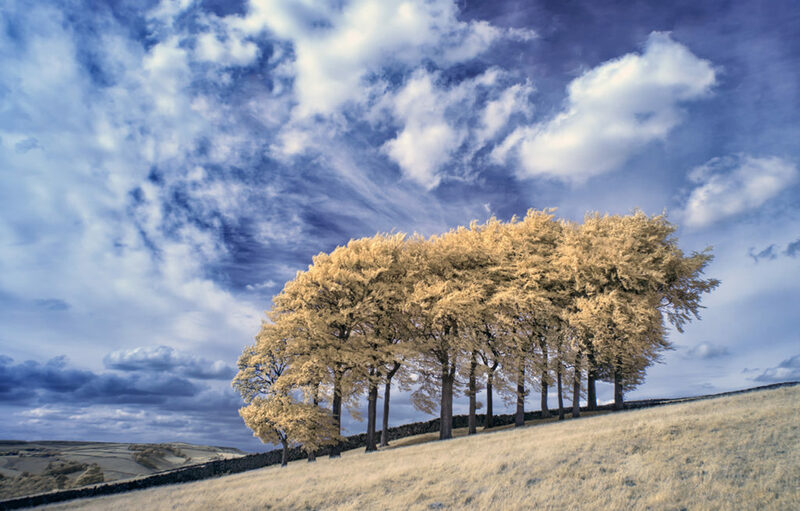 Twenty Trees is one of my favourite locations in the Peak District of England to photograph and a place I always visit when I am in the area. Its location high on a steeply sloping hillside makes it possible to create clean, uncluttered compositions and the dry limestone wall adds extra interest. 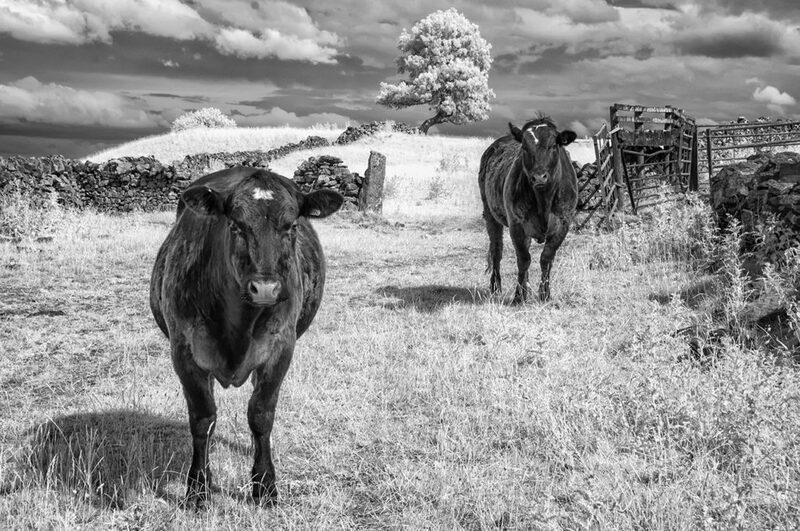 These two pretty girls confronted me, as I entered their field near the hamlet of Foolow in Derbyshire one recent afternoon, to photograph the picturesque tree in the background. They seemed to think I was there to feed them, as they immediately stood directly in front of me, staring at me fixedly. Within a few minutes, I was surrounded by a herd of about twenty cattle: all immobile, all staring. As I was raised in rural Ireland, I am accustomed to being around cattle, so I was not cowed (terrible pun intended) by their behaviour. The least I could do was take their photo. 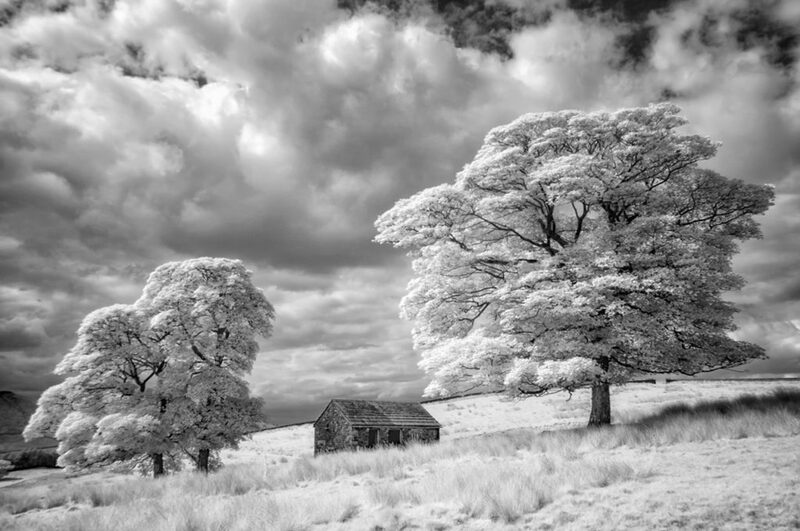 However, as I had only my infrared camera with me, it turned into this rather otherworldly-looking image. After about five minutes of our standing staring at each other like this, I pushed past them to get to the tree in the background, which was the real object of my attention. As I kneeled down to get a low angle from which to shoot the tree, the cattle made a close circle around me, standing no more than five or six feet from me, as I set up my gear. It was unnerving to feel their presence encircling me, their hot breath against the back of my neck as I worked. I had to shoo a few of them away repeatedly to get them out of the frame. After about fifteen minutes, probably when they realized that I wasn’t going to feed them, they lost interest in me, which allowed me to get an unobstructed view of the tree and to capture the second image. 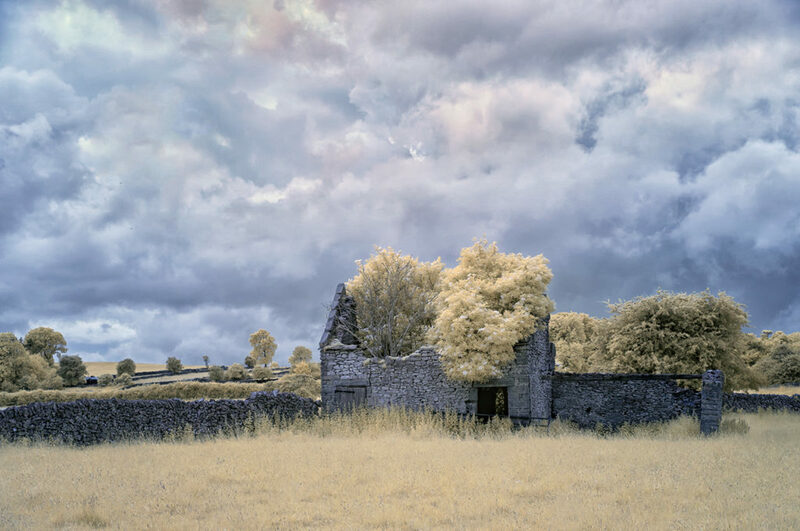 I happened upon this abandoned barn while driving alone through the countryside of Derbyshire in June. I don’t remember where it was: somewhere alongside one of the many roadsides that I traversed in my six-day visit to the Peak District. I spent those days driving alone, aimlessly, following my nose, my instinct, turning left or right as the notion took me, in a trance. I photographed the barn in infrared at 590nm and processed it as faux colour. Usually, as the final stage of post-processing, I convert such images to black and white but, in this case, I kept it as faux color. I liked the range of yellow tones and flecks of red in the clouds; the colour elements seem to combine to bring out the pathos of the place. For a couple of years now, I’ve been admiring photos of this pretty little stone barn in the Peak District Photography Group on Facebook and hoping to have an opportunity to photograph it myself one day. That opportunity came during my six-day solo photography tour of the Peak District in June. The barn sits a few hundred yards on the north side of the A54 road that crosses the high, desolate moorland between Buxton and Macclesfield in east Cheshire, not far from the famous Cat and Fiddle Inn (see location map, below). On the afternoon when I visited, the sky was dark and gloomy with heavy cloud cover and a blustery wind that threatened to bring rain at any moment. 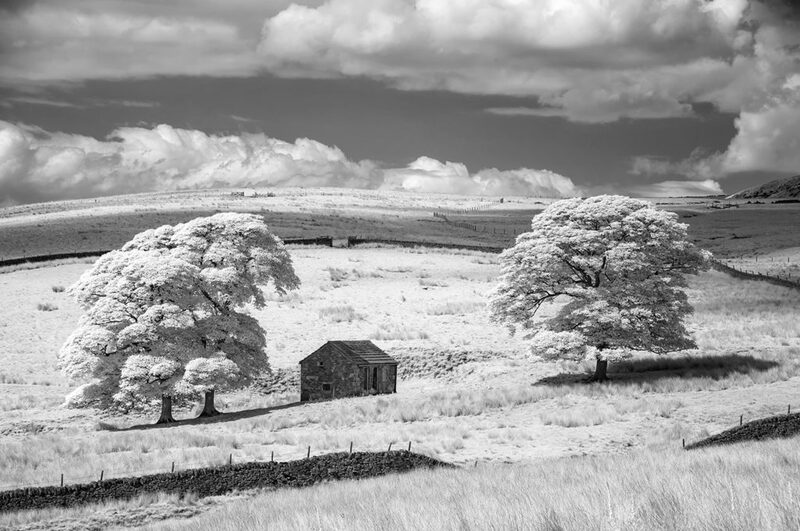 As the light was flat and uninteresting, I knew that colour photography would produce drab images, so I decided to photograph the barn in infrared. 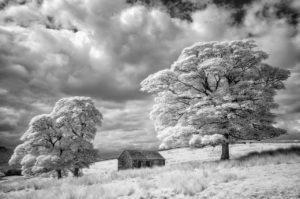 Because infrared photography requires direct sunlight for best results, I was faced with long pauses of thirty minutes or more between exposures, while I waited for the clouds to break and a shaft of sunlight to illuminate the land. This happened only a handful of times during the four hours or so that I was there, allowing me to capture these two images. The barn shot from the roadside on the A54. It was a pretty lonely and depressing experience to be up on that bleak, windswept moor on my own for four hours. I would have traipsed off back to my hotel in low spirits had it not been for the fact that, just as I was packing up my gear to leave at about 6 o’clock, a strikingly glamourous female fell runner came bounding over the moorland, accompanied by her dog, a loose-limbed, gangly German shepherd puppy. Improbably, given the chilly, swirling wind, she was wearing the type of women’s athletic gear that amounts to little more than a bikini, her bare midriff showing off her impressively toned body. I held open a gate to allow her to run through without stopping and, in response, she rewarded me with a cheery smile and shouted “thanks”. I was quite taken aback by the incongruity of encountering such an attractive woman running alone in this bleak, lonely landscape. It’s been almost a year since I made any kind of serious attempt at taking a photograph. During that time, neither my head nor my heart has really been in it. In the past few weeks, I have been trying to feel my way back into photography, albeit cautiously. Last month, I spent six days driving alone through the Peak District of England, exploring the area and looking for subjects to photograph. 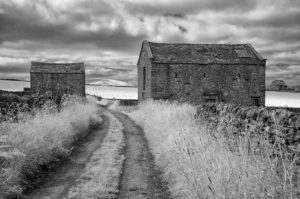 Among the most elegant subjects I discovered were these two old stone barns, called the Staden Barns, outside the town of Hartington in Derbyshire. 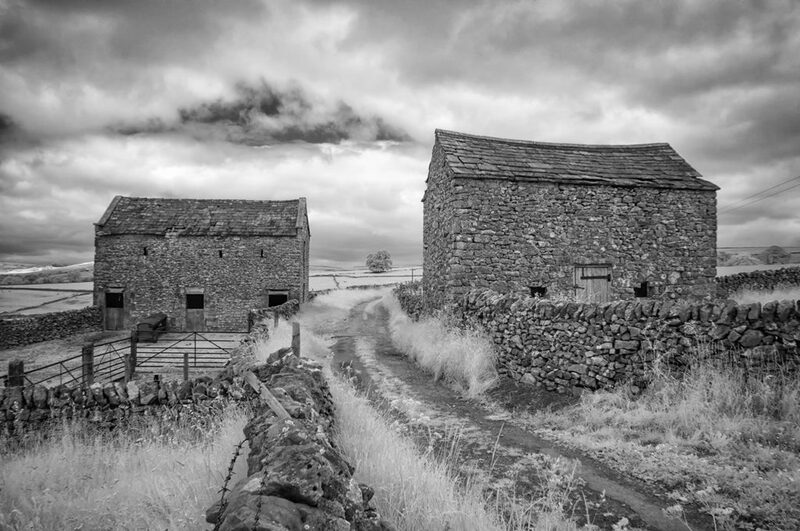 Straddling a narrow country lane lined by dry stone walls, it took a lot of searching and a long, arduous hike to locate these beautiful barns. I finally found them high in the hills south-east of the town. They were worth both the search and the hike.